Exactly how does the "cascade" in Cascading Style Sheets work? This concise guide demonstrates the power and simplicity of CSS selectors for applying style rules to different web page elements. You’ll learn how your page’s presentation depends on a multitude of style rules and the complex ways they function—and sometimes collide—within the document’s structure. This guide is a chapter from the upcoming fourth edition of CSS: The Definitive Guide. 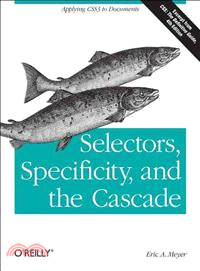 When you purchase either the print or the ebook edition of Selectors, Specificity, and the Cascade, you’ll receive a significant discount on the entire Definitive Guide when it’s released. Why wait when you can learn how to use selectors and other key CSS 3 features right away?